For skin that belies your age. 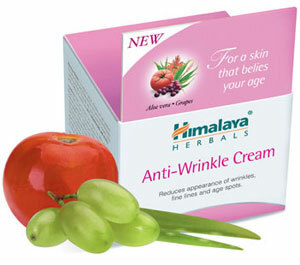 Himalaya Herbals Anti-Wrinkle Cream prevents premature skin aging. A lustrous cream fortified with Lentil and Licorice, powerful antioxidants that prevent free radical damage, our anti-wrinkle cream leaves your skin silky smooth. Grapes contain natural Alpha Hydroxy Acids (AHAs) which stimulate the production of collagen and elastin in your skin and help erase fine lines and wrinkles. The anti-aging ingredients Grape and Aloe Vera seep into your skin and help reduce the appearance of wrinkles, fine lines and age spots, while improving your skin’s resilience and firmness. Regular use protects and smoothens the skin's texture, to give you visibly younger looking skin. Massage Himalaya Herbals Anti-Wrinkle Cream gently on cleansed face and neck, morning and night. May be used alone or as a foundation before make-up.